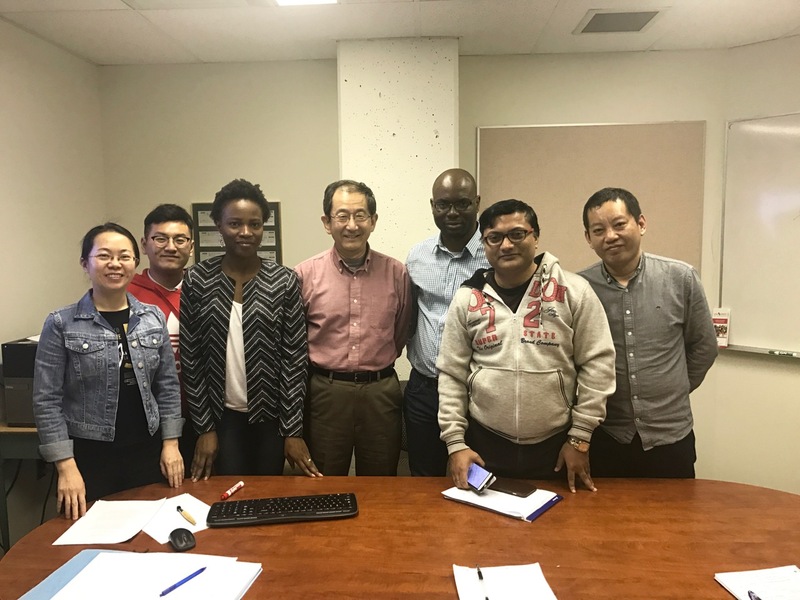 2017 Spring with Yan, Pengfei, Oladunni, Adeniyi, Dr. Bandyopadhyay, and Dr. Yu. Mingli Song (PhD, 2012), University of Alberta, Canada. Cenker Sengoz (MSc, Dec 2014), University of Winnipeg, Canada. Tokuyo Mizuhara (MSc, Sept 2009), Saint Mary's University, Canada. Wei Yuan (MSc, Sept 2008), Lakehead University, Canada. Jobin Sunny(MASc, Dec 2018), U of R, Canada. Qian Liu (MSc, April 2016), U of R, Canada. Nasrin Farajiparvar(MASc, April 2016), U of R, Canada. Yanzhao Cheng (MSc, March 2016), U of R, Canada. Talha Khan (MASc, July 2015), U of R, Canada. 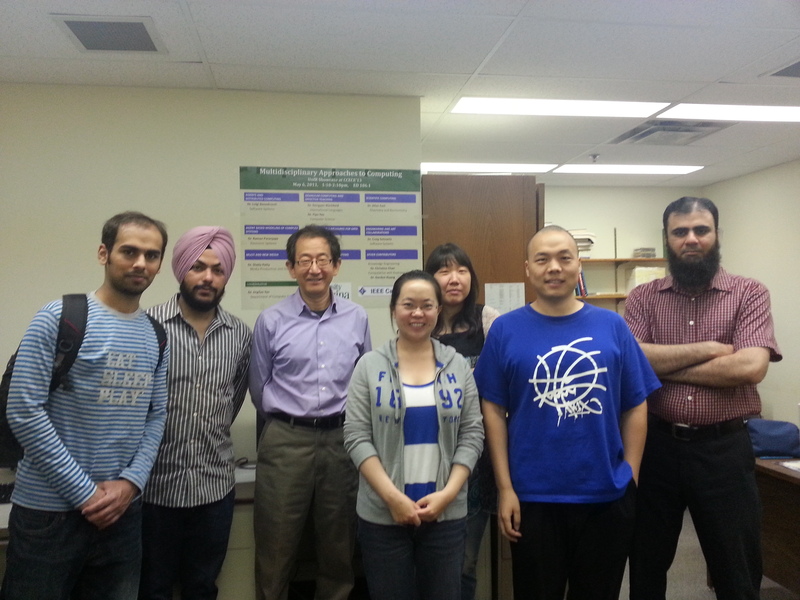 Yun Gao (MSc, April 2015), U of R, Canada. Imran Nathan Khan(MASc, Aug 2013), U of R, Canada. Ming Hua Lin (MSc, Feb 2011), U of R, Canada. Ting Zhang (MSc, July 2010), U of R, Canada. Mahinsasa Tennakoon (MASc, July 2009), U of R, Canada. Tao Wei (MASc, Sept 2007), U of R, Canada. Diego Carrera (MASc, Dec 2006), U of R, Canada. Yimei Zhang (MASc, Oct 2005), U of R, Canada. J.T. Yao, O.A. Oladimeji, and Y. Zhang, Fractal Analysis Approaches to Granular Computing, In: Polkowski L. et al. (eds), IJCRS 2017, LNCS 10313 pp 215-222, 2017. Y. Zhang and J.T. Yao, Multi-criteria based Three-way Classifications with Game-theoretic Rough Sets, In: Kryszkiewicz M., Appice A., Slazak D., Rybinski H., Skowron A., Ras Z. (eds) Foundations of Intelligent Systems. ISMIS 2017, LNCS 10352, pp 550-559, 2017. J.T. Yao, N. Azam, Web-based Medical Decision Support Systems for Three-way Medical Decision Making with Game-theoretic Rough Sets, IEEE Transactions on Fuzzy Systems (IF 6.3, Q1), 23(1):3-15, 2015. B. Majeed, N. Azam, and J.T. Yao, Thresholds Determination for Probabilistic Rough Sets with Genetic Algorithms, RSKT 2014. LNCS (LNAI) 8818, pp. 693-704, 2014. Y. Zhou, J.T. Yao, A Web-based Learning Support System for Rough Sets, RSKT 2014. LNCS (LNAI) 8818, pp. 161-192, 2014. N. Azam, J. T. Yao, Analyzing Uncertainties of Probabilistic Rough Set Regions with Game-theoretic Rough Sets, International Journal of Approximate Reasoning, 55 (1), 142-155, 2014. Y. Zhang and J.T. Yao, Rule Measures Tradeoff Using Game-theoretic Rough Sets, F.M. Zanzotto et al. (Eds. ), Proceedings of the International Conference on Brian Informatics (BI'12), Macau, China, Dec 4-7, 2012, LNCS 7670, pp.348-359. J.T. Yao, Y. Zhang, Game-Theoretic Rough Sets for Three-way Decision (in Chinese), in X.Y. Jia, L. Shang, X.Z. Zhou, J.Y. Liang, D.Q. Miao, G.Y. Wang, T.R. Li, Y.P. Zhang (Eds. ), Theory of Three-way Decisions and Applicatiion, Nanjing University Press, pp103-115, 2012. N. Azam, J.T. Yao, Comparison of Term Frequency and Document Frequency Based Feature Selection Metrics in Text Categorization, Expert Systems With Applications, 39(5):4760-4768, 2012. N. Azam, J.T. Yao, Incorporating Game Theory in Feature Selection for Text Categorization, RSFDGrC 2011, Moscow, Russia, June 25-27, 2011, LNCS(LNAI) 6743, pp215-222. D.W. Kim, J.T. Yao, A Web-Based Learning Sup port System for Inquiry-Based Learning, J.T. Yao (ed. ), Web-Based Support Systems, Springer-Verlag London, 2010, pp125-143. J.T. Yao, J.P. Herbert, Financial Time-series Analysis with Rough Sets, Applied Soft Computing, 9(3):1000-1007, 2009. J.T. Yao, J.P. Herbert, A Game-Theoretic Perspective on Rough Set Analysis, 2008 International Forum on Knowledge Technology (IFKT'08), Chongqing, Journal of Chongqing University of Posts and Telecommunications, Vol. 20, No. 3, pp291-298, 2008. J.T. Yao, J.P. Herbert, Web-based Support Systems with Rough Set Analysis, Proceedings of International Conference on Rough Sets and Emerging Intelligent System Paradigms (RSEISP'07), June 28 -30, 2007, Warsaw, Poland, LNAI 4585, pp 360-370. J.T. Yao, D. W. Kim, J. P. Herbert, Supporting Online Learning with Games, Proceedings of SPIE Vol. 6570, Data Mining, Intrusion Detection, Information Assurance, And Data Networks Security, April 9-13 2007, Orlando, Florida, USA, edited by Belur V. Dasarathy, (SPIE, Bellingham, WA, 2007), 65700G-(1-11). J. T. Yao, W.N. Liu, Web-based Dynamic Delphi: a New Survey Instrument, Proceedings of SPIE No 6241, Data Mining, Intrusion Detection, Information Assurance, And Data Networks Security, April 17-18, 2006, Orlando, Florida, USA, edited by Belur V. Dasarathy, (SPIE, Bellingham, WA, 2006), pp.169-179. J.T. Yao, M. Zhang, Feature Selection with Adjustable Criteria, Proceedings of the 9th International Conference on Rough Sets, Fuzzy Sets, Data Mining and Granular Computing (RSFDGrC'05), Regina, Canada, Sept 1-3, 2005, LNAI 3641 pp.204-213. W.N. Liu, J.T. Yao, Y.Y. Yao, Constructive Fuzzy Sets with Similarity Semantics, Proceedings of the 24th International Conference of NAFIPS, Ann Arbor, USA, June 22-25, 2005, pp591-596. J. T. Yao, M. Zhang, A Fast Tree Pattern Matching Algorithm for XML Query , Proceedings of the IEEE/WIC/ACM International Conference on Web Intelligence, Beijing, China, Sept 20-24, 2004, pp235-241. W.N. Liu, J.T. Yao, L. Fan, Y.Y. Yao, X.D. Yang, Web-based Support Systems for Sustainable Communities, Proceedings of the Second Workshop Web-based Support Systems (WSS'04), Beijing, China, Sept 20, 2004, pp102-110. W.N. Liu, J. T. Yao, Y.Y.Yao, Rough Approximations under Lever Fuzzy Sets, Fourth International Conference on Rough Sets and Current Trends in Computing (RSCTC'04), Uppsala, Sweden, June 1-5, 2004, LNAI 3066, pp78-83. M. Zhang, J. T. Yao, XML Algebra for Data Mining, Proceedings of SPIE Vol. #5433, Data Mining and Knowledge Discovery: Theory, Tools, and Technology VI, 12-13 April 2004, Orlando, USA, edited by Belur V. Dasarathy, (SPIE, Bellingham, WA, 2004), pp209-217. If you'd like to pursue a higher degree after your graduation and are interested in my research topics, please read about our application details here. It is not necessary to contact me as I am normally unable to respond to email messages about applications to our program. You may, however, state in your statement of purpose that you are interested in my research. TOFEL above 80 (computer-based 237 or paper-based 580) or IELTS 6.5 for non-native speakers except for exempted universities. Please note that I do not have summer internship positions at this time. For UoR students, we have an NSERC USAR program. You will be paid for over $5000 for summer research. Wikipedia has a general description on Canadian PhD Programs.